The coop is 5 by 6 feet. The run is 5 by 16 feet. It was built to house 8 Buff Orpingtons. 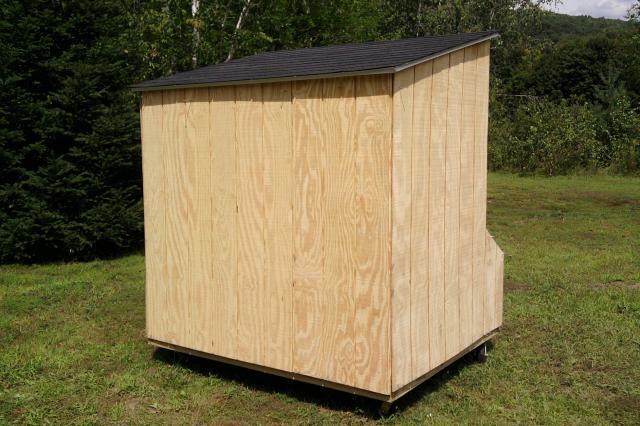 The design was inspired by a coop I saw outside the local farming supply store, pictures I found on backyardchickens.com, and a shed that I built in 2009. 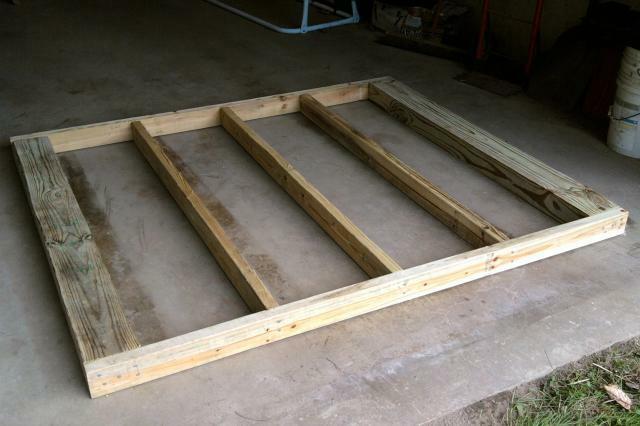 I used pressure treated lumber for framing the floor and for framing the run. The floor and roof are exterior grade plywood. Asphalt shingles and drip edge were used for the roof. It is insulated with fiberglass insulation. Vinyl coated fencing was used to cover the window and the vent. Poultry fencing was used to enclose the run. Corrugated pvc panels were used for roof of the run. 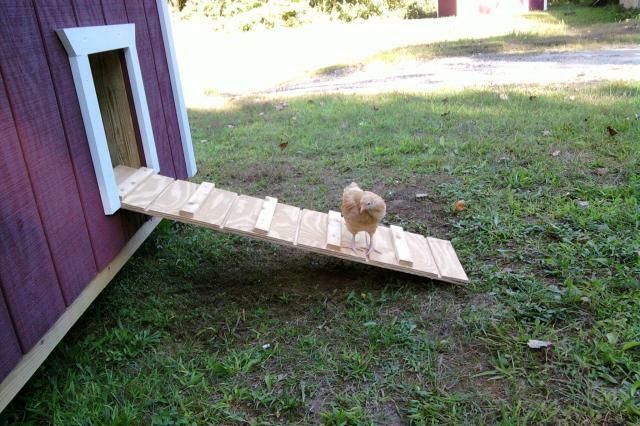 The coop was built with wheels, but to move the coop would be very difficult. A small vent above the door. Galvanized 2" x 4" fencing over the original poultry fencing. I replaced the pop door with one that could be operated from the outside. I wouldn't position the large vent so close to the roosts. Framed the floor with 2 x 4's and 4 x 6's. 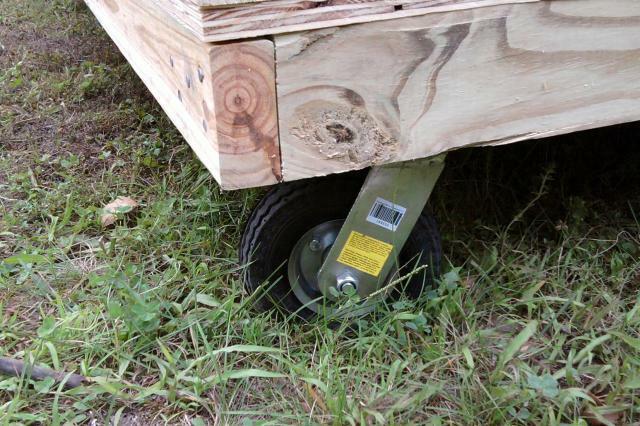 Attached casters to 4 x 6's and added plywood floor. Framed the walls with 2 x 4's. 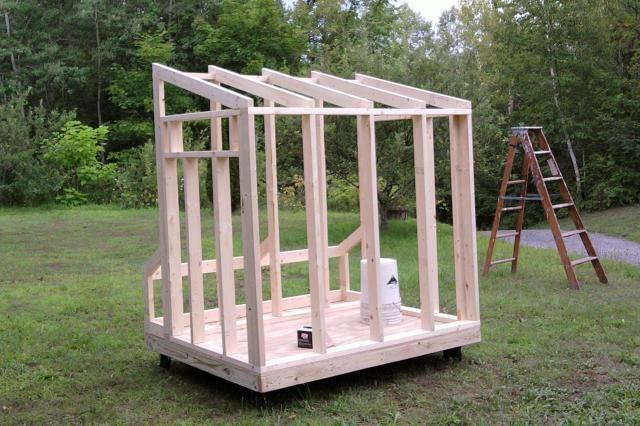 Framed roof with 2 x 4's. Attached drip edge and shingles to roof. Tacked on T1-11 siding to walls. Cut out openings for doors and window. Installed double hung window. Added door to nests. Attached door to the vent. One of the girls checking out the new coop. Still need to add the run before everyone can move in. Chickens are finally in their new coop. Framed run with 2 x 4's. Used corrugated pvc panels for roof of the run. 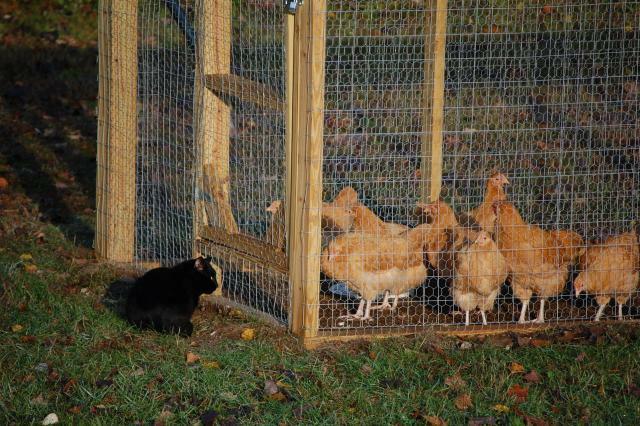 Used poultry fencing for containment. 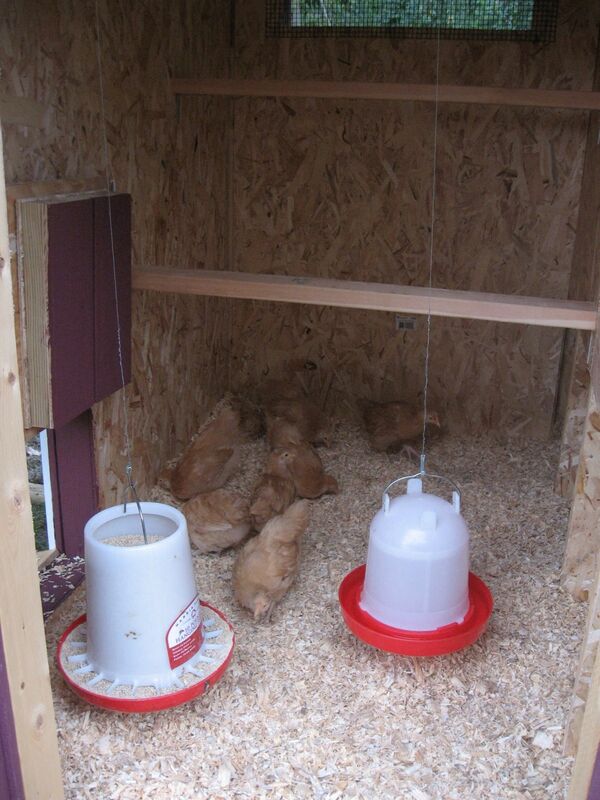 This coop is an excellent setup for a small layer flock! Works even better with bantams! 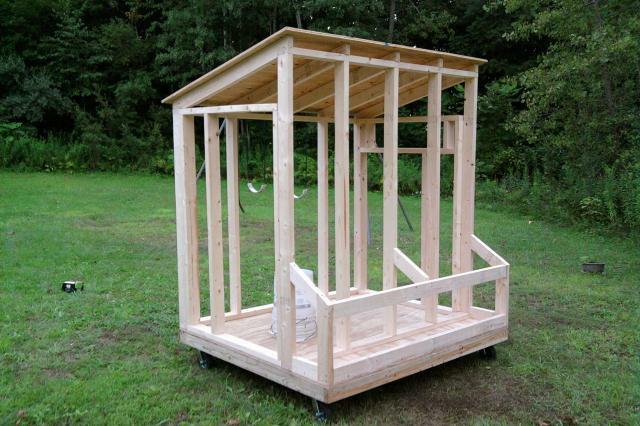 "This is a great coop and run"
This coop seems well built and the run is large and covered. It would be great to see inside pictures since I am curious about the roosting arrangement. Wow very nice coop! 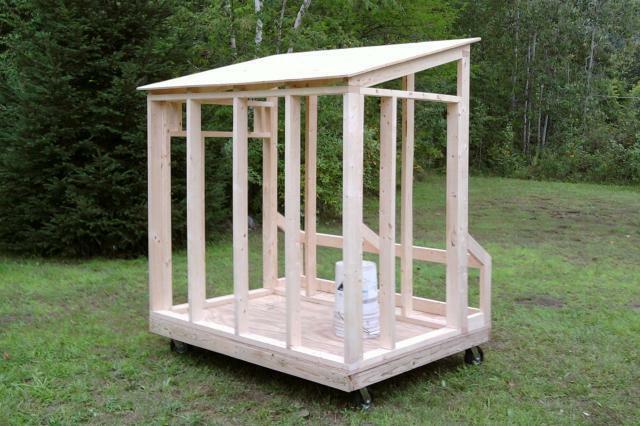 Is there any chance you have any kind of blueprints or measurements because I would like to build this coop myself?? hate to be a bother but do you have any more interior shots? 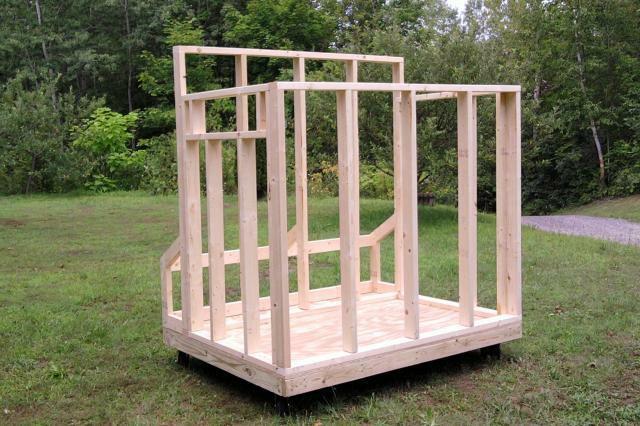 I can build structures but how to lay out the interior of a coop is baffling to me right now. Thanks! I hope my coop looks as good as yours. My wife thinks it's awesome, too. The coop and the article are fantastic. Thanks for posting this. My wife and I are going to be taking some chickens from a friend who is moving (we thought six but turns out to be ten hens). Things are moving quickly (chickens arriving in two days!). I measured out a place and I think I can re-work this wonderful design to fit the area and the chickens. Thanks so much and wish us luck! I intend to build such a house. Do you have the opportunity to give me the exact measurements, height, length, width, etc. 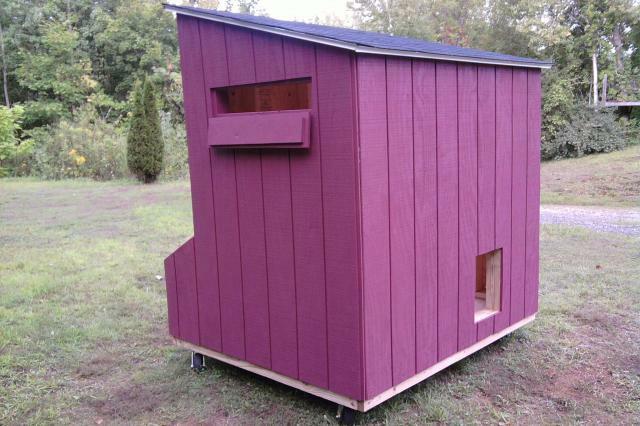 great looking coop, how are the roosts arranged? looks great! Where are the roosts? Thanks for posting this. Gives me some ideas for my coop! I love your coop, it's really cute and your buffs are adoreable too. Why is their snow in the run if the run is roofed in? Was the wind that bad? I had concerns about the flat roof at first, but I haven't had any troubles with it. 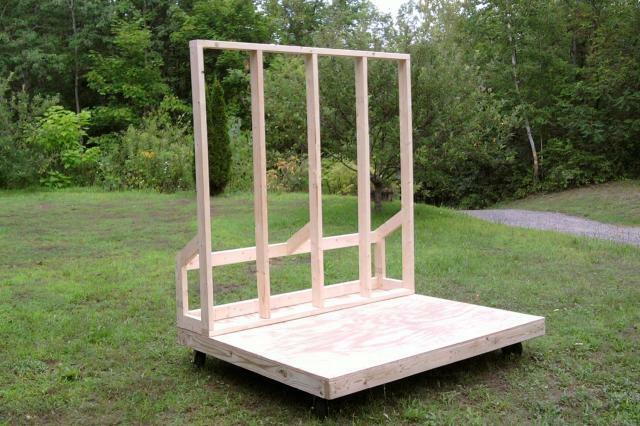 If I remember correctly, the materials for the coop and the run were approximately $600. I did have some materials left over that I used to start a Chicken Tractor. Any issues with the flat roof on the run? Thinking about adding a run to my barn and converting it. 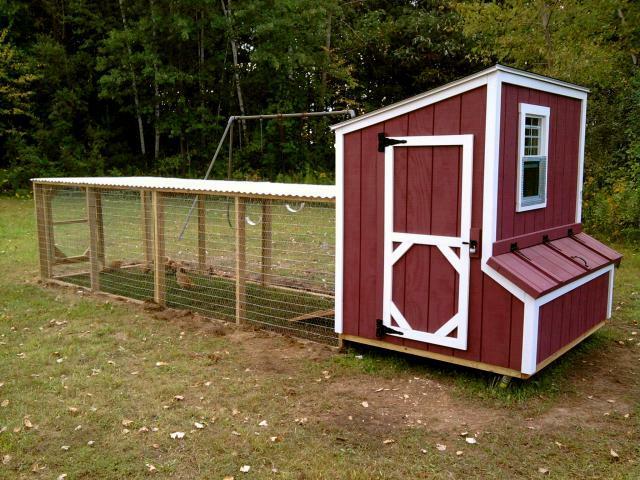 GREAT looking coop! Job well done! Nice! 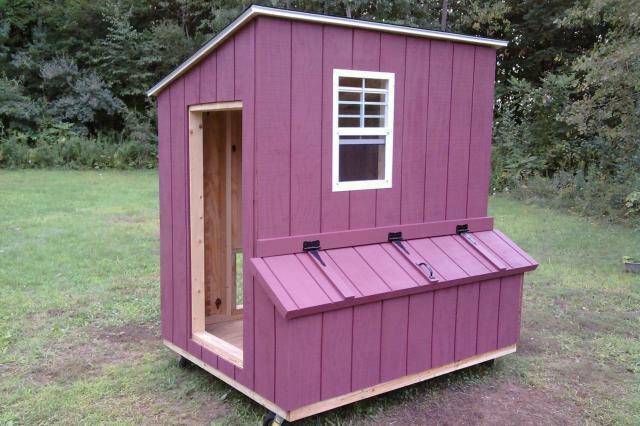 Can you give an estimated cost for the materials you used for this coop and run setup? very handsome! I've raised chickens a long time now and I like coops that I can stand up in. Your girls are so pretty! Are they Buff Orpingtons? To answer aflad2012's questions. My chickens don't seem to mind the snow. But I do spread straw around the run during the muddy season. I also added an exterior pop door that can be opened by pulling a rope. I close them in at night when it drops below 50 degrees. I love watching them race out in the morning. Here's a video of the morning rush. 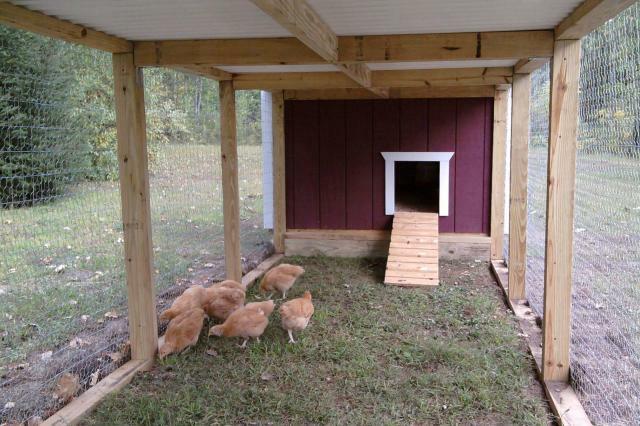 This is the best photo I could find that shows the inside of the coop. The coop is such a cute coop! Could you post some pictures of what the inside of the coop looks like? That would be great. Love the coop! We're looking at designs now so we can build one for our very first chicks (8!) arriving March 20th. Do you have any pics of the inside? I'd love to see the inside set up if possible. Thanks!! Your coop and run are beautiful. 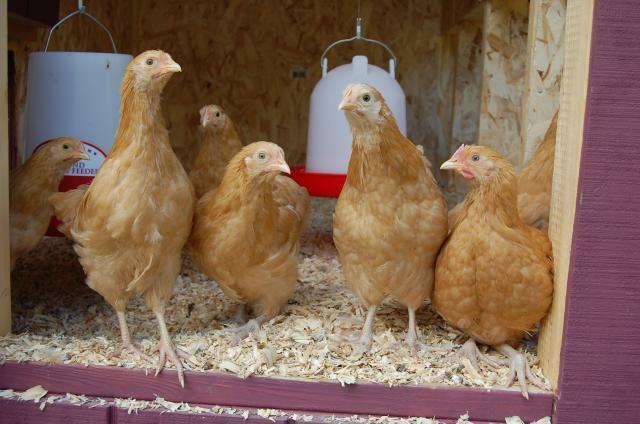 They are just perfect in size, color and style for a backyard flock! Very inspiring! Thanks for the "after thoughts". Really helpful. Can't wait to get started on mine! i love it!!!!!!!! that cat looks like a black panther! What a great looking coop! Do you leave the door open for them to come out or do you close it at night? 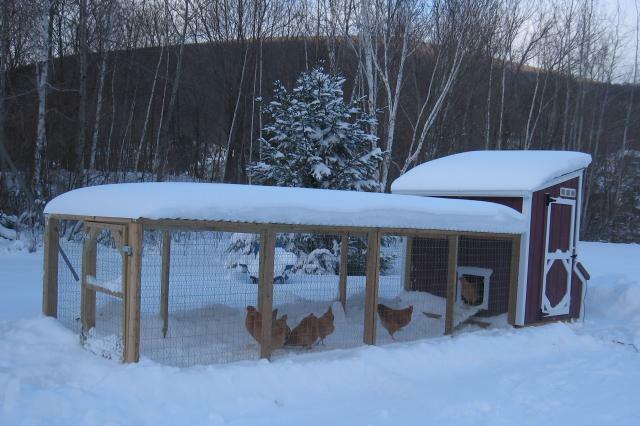 Also, how does your hens like the snow? really beautiful coop and simple design - the best of both worlds.